If you’re looking for a good warm up before attempting a run on Cherry Creek, this is the river for you. 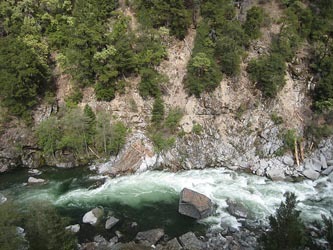 The Cal Salmon is the next step up in difficulty from other California rafting classics such as the North Fork of the American or the Tuolumne. The rapids are long, powerful, and run at a steep gradient. Narrow canyon walls create tight space for flows and therefore the water rushes with increased intensity. There is less than a mile of warm-up before Bloomer Falls, the first big Class IV rapid. Bloomer is followed by a flurry of Class IV and V whitewater from Airplane Turn and Cascade Rapid, a tight 15′ chute of churning whitewater. Another standout is the grand finale rapid, Class V Freight Train. This is the river’s longest, boulder-strewn area. It’s definitely one of the highlights of this magnificent river. Everything from boulder slaloms to enormous holes can be found on the Nordheimer run. While the rapids are enough to make this run entirely worth the long haul into the NorCal woods, the scenery is no doubt the icing on the cake. Frequent wildlife sightings of black bear, deer, and many species of birds, found amidst a dense, lush forest, and snow covered mountains. For the best combination of remoteness, beauty, and whitewater, you really can’t beat the Cal Salmon. Although it’s a bit of a trek from, well, anywhere really, it’s an incredible trip and you won’t regret making the long haul to get there.